a? ?There is no more supply. What is rare now will be even more rare in ten years. If a major find should be made in any of the source nations, it would be impossible for it to reach the market. The more you hold on to ancient objects, the more valuable they will become. Of course, the moment that somebody decides to sell something, it is usually expected that he will get less than he will like. But the moment a buyer decides to buy something, he is expected to pay a little more than the market value. Antiquities are traditional, not something that goes in and out of fashion. They have always been collected throughout history.a?? A Roman marble bust of the Greek philosopher Plato (427-347 BCE) has several characteristics that date its composition to at least the second half of the second century. Yet, the sculptora? ?s renditions of the philosophera? ?s beard and mustache are in the style of the Greek Classical Period (5th-4th century BCE). Perhaps the bust is a copy of an earlier Greek version? What we do know for certain is that the Romans loved to keep portraits of the great Greek philosophers in their libraries, where scrolls of the writings of Plato and Aristotle were housed. The 26 cm. (10.2 inch) sculpture is currently on view and for sale at Phoenix Ancient Art. Like many of the works to be found in the gallery, it evokes a sense of the time in which it was made. Hicham and Ali Aboutaam, the owners of Phoenix Ancient Art, like the educational aspect as well as the beauty of antiquities. In this superb bust we can learn a bit about the culture of the Romans of the second century. 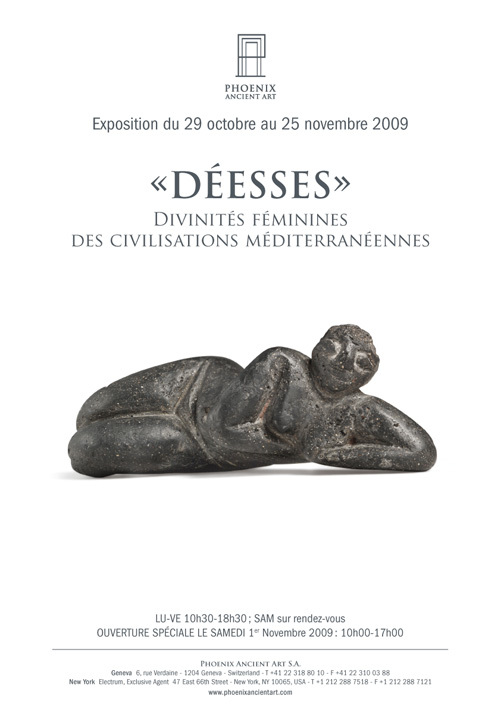 Roughly translated as Goddesses: Feminine Deities of Mediterranean Civilisations. “The Geneva Gallery is located at 6, rue Verdaine. The Aboutaams hope to see you there. Hicham Aboutaam of Phoenix Ancient Art offers objects from a huge range of time periods and geographical locations.A? One of the more astounding artifacts on offer is a Scythian bamboo bow and quiver set. This remarkably preserved set is from the 3rd to 1st century. The state of preservation is astounding, with wood and leather paint almost perfect. Also incredible is the fact that this set has remained together through the ages. The bamboo bow is shaped into a triple curve, the center curve for hand placement, and the top and bottom curves to increase the action of the bowstring. Scythian refers to a group comprised of many tribes which were nomadic. They spoke the Iranian language and roamed throughout the area from the Danube river plains to the Central Asia steppes and eastward to Siberia. The Scythian main occupation was as warriors, and even Scythian women were welcomed to fight in battles. This artifact is quite a find, not just for its inherent beauty but for its historical value as well. 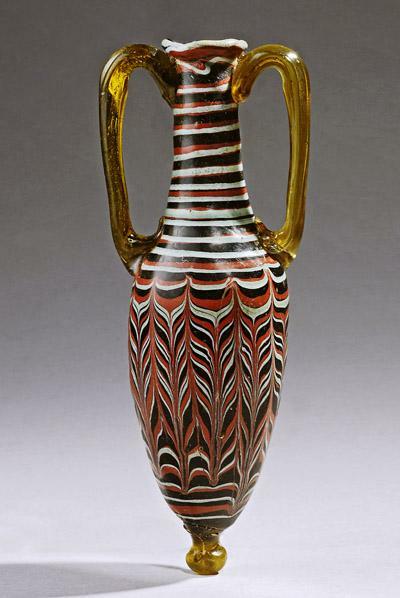 Having developed an impeccable reputation as ancient art dealers, the Aboutaam brothers, Ali and Hicham, of Phoenix Ancient Art, can be depended upon to acquire extraordinary works of art of high historical and artistic value. Among the Aboutaams’ many offerings is a significant figure from circa 2200 B.C.E. 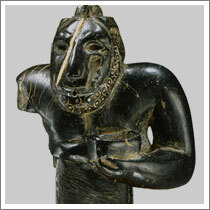 of black chlorite believed to represent a Near Eastern demon known as the Narbemann, or a? ?scarred man.a?? Although the demon is frequently represented as a scaly man with a striking gash on his face, this particular representation is smooth-skinned. The tell-tale scar is present on the right side where the original ivory inlay is still complete clearly signifying that this is a representation of more than four thousand years old of the Narbemann.